Children sometimes being the less inhibited individuals they are, can often be found doing various things like running sticks along fence posts, drumming on table tops or tapping glass, among other things, if presented with the opportunity and the means. The appeal of these typically innocuous activities is not all that surprising when the thought of sound, pitch and volume are taken into consideration. Why not make noises if they sound good and no one is stopping you? That said, this carefree philosophy doesn’t always carry over into places like offices, venues and other environments where a level of restraint and decorum is expected – which of course is where the most interesting sounds are liable to be found – probably due to complex architecture and materials. England’s Sage Gateshead set out to contrast this expectation and not only that but their creative intrigue does not even require a trip across the pond for personal validation. So, what is Play Sage Gateshead? Put simply, it is an app, desktop and VR device compatible program (Oculus Rift), intended for the exact purpose its title and venue namesake implies: Playing music (albeit digitally) on parts of the venue itself, turning Sage Gateshead into a musical instrument. 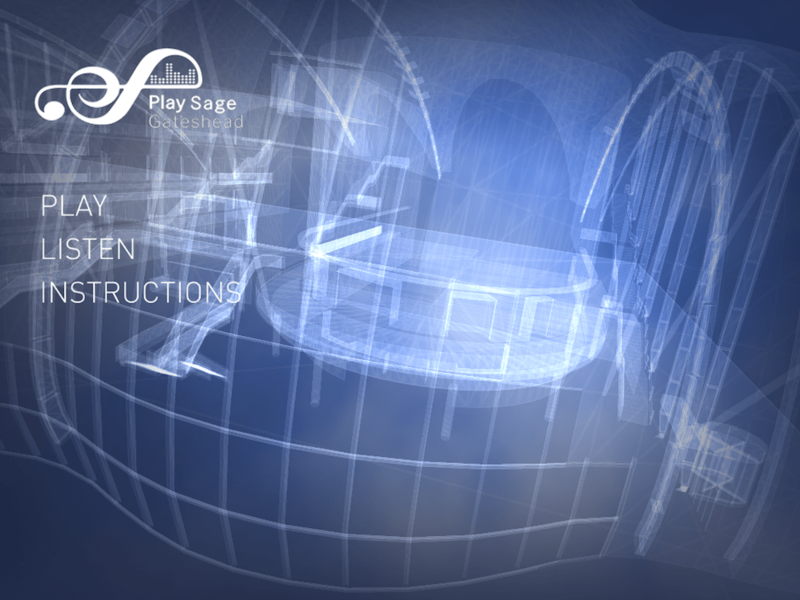 An app designed to provide an immersive audio-visual experience, while also highlighting an element of personal creativity, Play Sage Gateshead is a first person, point and click app where users can explore the inside of the venue as an identical, three-dimensional virtual recreation. Different parts of the venue –railings, walls, poles and so on – invoke a variety of sounds that can be recorded and mixed together, creating brand new pieces of music. The sounds heard from playing the various parts of the building are natural clips, recorded when developers performed assorted actions (e.g. striking, scraping) specified within the app. Developed together by London’s Mbryonic design studio and Gateshead based, Atomhawk Design, and commissioned in partnership with non-profit public service, The Space, Play Sage Gateshead also exists as a lasting commemoration of “Tenpulse,” a percussive performance commissioned by the venue last December, in honor of its 10th anniversary. It was during this multi-day performance that musicians struck parts of the venue, accruing the samples programmed into the app. Music making aside for a moment, the app itself is also a work of art. Venue photos and floor plans were used to help construct the digital Sage Gateshead and once past architectural imitation, creativity went from there. 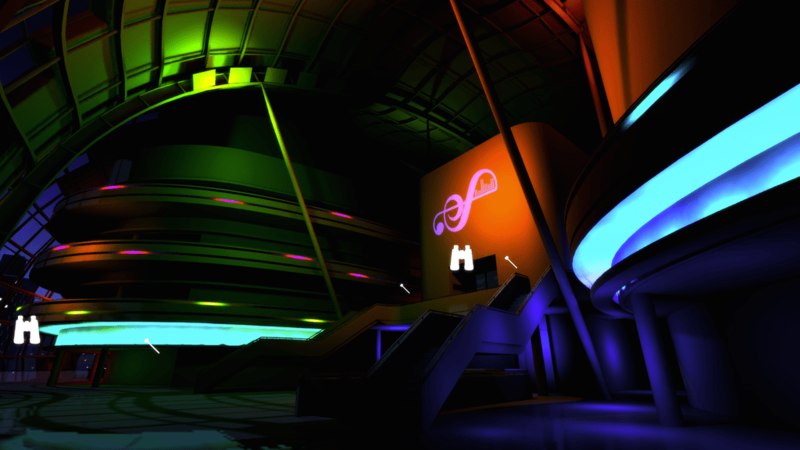 An aesthetically pleasing application of vibrant, glowing colors, splashes of light and subtle ambient music serving as a gentle undercurrent in background, give the virtual venue an almost futuristic, “Night at the Museum-esque” feel. There are six different “playing points” scattered throughout the venue, signified by a hammer. Other markers provide “observation points” and give an overall perspective of the venue not attainable otherwise. (Location change post-clicking is automatic and is executed through a floating style movement.) 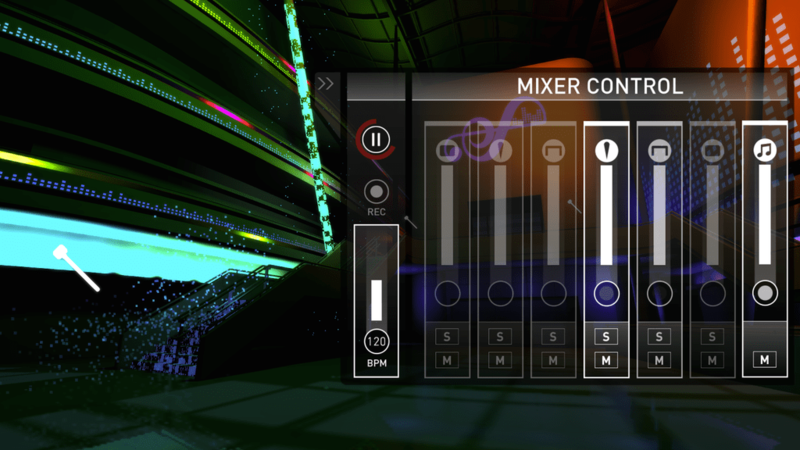 After finding multiple playing points and the accompanying instruments, users can experiment with the available mixing panel and click track, recording short songs with the instruments and played noises set to any combination one chooses with the sliders. Engage the app in “Listen Mode” and points hidden around the environment will unlock short samples of music from the Tenpulse performance. Play Sage Gateshead is available now, for free, in the iTunes App Store and is compatible with iPhone and iPad and iPod Touch running iOS 7.0 or later. It can also be played via web browsers with the Unity plug-in. (Computers missing the plug-in will be prompted with a request to download upon clicking to play.) Owners of the Oculus Rift can download the files necessary to play directly from the Play Sage Gateshead website.